Barisal University (BU) Admission Test Circular 2017-18 has been published. 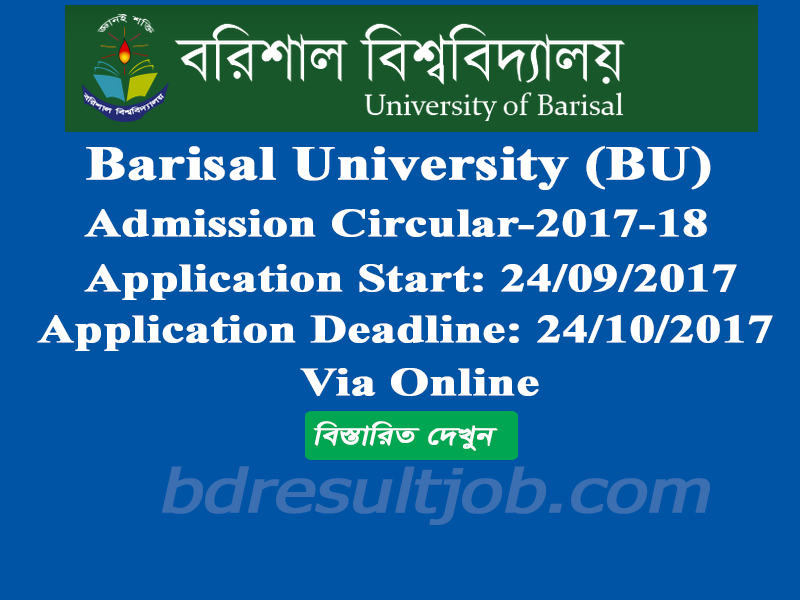 Barisal University (BU) Admission Test Circular 2017-18 will be the beginning date of 24 September to 24 October, 2017. 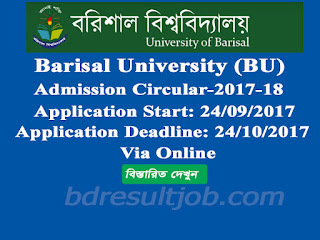 Barisal University (BU) Admission Test Circular 2017-18 and Admission related all information will be found in Barisal University (BU) Official website at http://admission.eis.bu.ac.bd/. 4. Upload your Photograph and submit your application. 5. After submission your application must confirmation application. Your mobile message send 16321 number (Application show message body). Reply message 7 (seven) digit a confirmation code. After confirming the location of this confirmation code, click on the confirmation button. 6. After completing the application you have a payment slip with two parts. Sign in in and Note your cell phone number below the Bank Copy. Now go to any Sonali Bank Limited, Agrani Bank Limited, Rupali Bank Limited, Janata Bank Limited and complete the payment manually. After complete money When deposited it show green right sign. Barisal University (BU) authority admit card issue 05 November 2017. Login your account details http://admission.eis.bu.ac.bd/ and download your admit card. KA unit last date download admit card: 25 November 2017 at 10:00AM. KHA unit last date download admit card: 24 November 2017 at 09:00AM. GA unit last date download admit card: 24 November 2017 at 02:00PM. Barisal University (BU) authority Admission test examination place, time and seat plan will published on http://admission.eis.bu.ac.bd/ and Mobile SMS. Login your account details http://admission.eis.bu.ac.bd/ and See your Admission test examination place, time and seat plan . After test examination will published Admission test result. Any applicant can download and view from Barisal University (BU) official website http://admission.eis.bu.ac.bd/ search their Admission Test Roll Number. After test examination will published Admission test waiting list result. Any applicant can download and view from Barisal University (BU) official website http://admission.eis.bu.ac.bd/ search their Admission Test Roll Number. Tags: admission eis bu ac bd, bu seat plan. Barisal University (BU seat plan. bu admission. Barisal University (BU) admission 2017. bu KA unit seat plan. barisaluniv edu bd, bu ga unit seat plan. Barisal University (BU) KHA unit seat plan. Barisal University (BU) KHA unit seat plan. Barisal University (BU) seat plan Admit Card. bu admission seat plan. Barisal University (BU) admission 2017-18. bu seat plan. Barisal University (BU) admission test result 2017-18. Barisal University (BU) admission test waiting list result 2017-18. Barisal University (BU) admission seat plan 2017.